Being an 11-year-old boy can be tough, as this is the time when he finds himself in the transition from being a kid to becoming a teenager. He is in the pre-teen phase wherein lots of changes happen in different aspects of his life. His preferences start to change, especially when it comes to toys and other gift items. 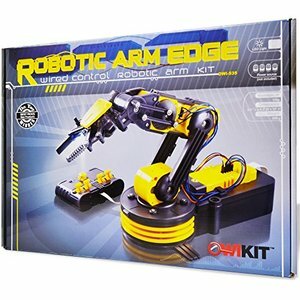 Made and designed by a reputable company, Robotic Arm Edge comes with a lot of capabilities; from finger-grippers to different joint movements. Likewise, it can rotate up to 270 degrees. It has safety features that suit the needs of an 11-year-old kid. It has a gripper containing a search light designed for night use, and five gear boxes containing a safety gear audible indicator that could prevent gear breakage and possible injuries. What's Great About It: It is affordable and of good quality. It is easily programmable as well. However, it may be challenging to put the screws in, but that’s an indication of the screws’ high quality. 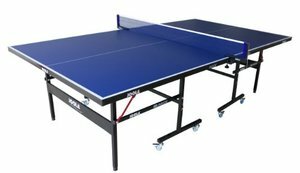 Does your child dream of becoming a professional ping pong player someday? If so, this would be the perfect gift for him. 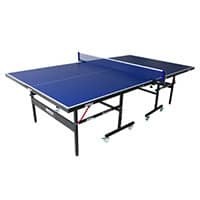 The JOOLA Inside Table Tennis Table is suitable for players who are really into the game and would love to have a durable table. It comes with dual locking services and four locking casters for additional safety. It also features compact storage, solo playback mode, and separate folding halves. What's Great About It: Apart from its good quality, it is also easy to set up. It is easy to handle as well. It is very rare to find a low-priced item with such high quality like this one. Lastly, this may look like a professional’s equipment, but it is kid-friendly and can encourage 11-year-old children to play the sport. 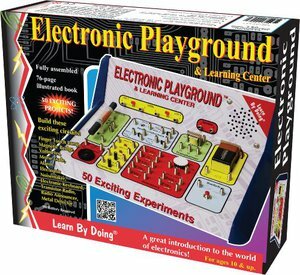 If your child is fond of electronics, then consider giving him this electronic playground. An 11-year-old kid will enjoy playing with this, particularly as he builds the electronic devices like metal detector, magnetic bridge, and electronic keyboard. This item prepares your electronically inclined child to become an electronics engineer someday. It is a smorgasbord of everything electronic designed especially for children. What's Great About It: Having this electronic playground is a great way to enhance your child’s electrical and electronic skills. It also helps your child develop problem solving skills. This set is made for children aged 8 years and older. Does your child love to play catch? You may want to consider buying this item if you want something that provides a twist to this well-loved outdoor game. 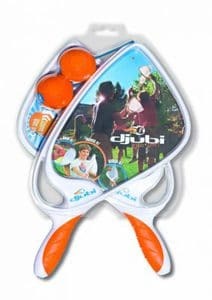 Djubi is an outdoor toy that comes with specially designed rackets, nets, and unique balls called Djubi. The ball can float and launch up to 100 feet, making it perfect for use in the swimming pool or at the beach. What's Great About It: In this modern world where most children opt to play with gadgets, it is very refreshing to have something that they can play with outdoors. This toy is suitable for children aged 8 and above. It is common for boys to play with robots. But as you know, playing with one differs from building one. 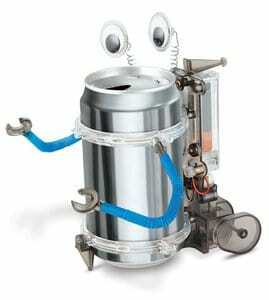 If your child wants to try the latter, purchasing this 4M Tin Can Robot would be a good idea. 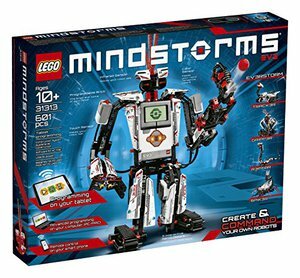 Apart from having fun, your child can enhance his imaginative skills with this robotics kit. He may opt to build a silly robot, a monster, or a combination of the two. What's Great About It: This set enhances your child’s creativity as he becomes knowledgeable about how to build a robot. Also, it helps him become aware of the benefits of recycling as he turns a soda can into a robot. This toy is for kids aged 8 and up. One common trait of 11-year-old boys is the fondness for anything mechanical and electronic. This electronics kit made it onto the Dr. Toy 100 Best Children’s Products and Dr. Toy Best Educational Products list. 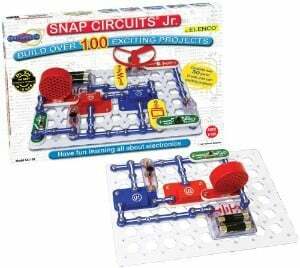 This electronics discovery kit allows children to have a hands-on experience in building and designing electrical circuit models. It comes with 30 parts and enables users to accomplish 100 projects that include flashing light, photo sensor models, and an adjustable-volume siren. What's Great About It: It is obviously an educational kit that suits a child who has a great interest in electronics. This set provides basic knowledge of electronics, so it is the perfect set for boys who are still beginners, but show an interest. If your 11-year old boy likes to be adventurous and wants to see the world from a different angle, you can never go wrong with the X5C RC Quadcopter by Akaso. Its ease of use and maneuverability is a charmer even to first-time drone flyers. This item promotes performance, durability, and fun. 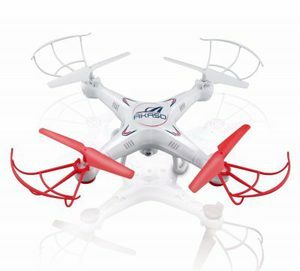 Likewise, it comes with high-quality materials on its propellers, a built-in HD camera that can capture both photos and videos, battery packs for continuous use, and an interference-free transmitter. What's Great About It: It is durable and easy to control. It offers a lot of fun for parents and children alike. The extras, such as the SD card, batteries, and portable charger that it comes with are a plus. 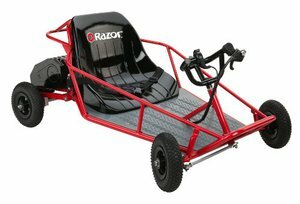 Your 11-year old deserves a ride that will define his childhood, and he can have it with this Dune Buggy by Razor. This buggy comes with a 350-watt electric motor that powers it to speeds of up to 10 mph. With knobby pneumatic tires, padded bucket seats, and a seatbelt to boot, this buggy can support driver weights up to 120 pounds, and can traverse different terrains with ease. What's Great About It: It gives your children a glimpse of what responsible driving involves. With its durable construction and added features, you can have a fun and safe drive around the neighborhood. 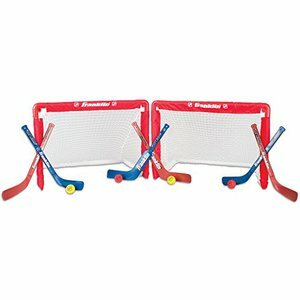 If your 11-year-old loves sports, he will definitely enjoy this Franklins Sports’ NHL Mini Hockey Goal Set. Not only does it come with an easy to set up goal nets, it also features two goalie sticks, four hockey sticks, four soft mini balls, and a durable polyester bag that you can use to carry the bunch together. What's Great About It: It’s a good product to promote sportsmanship among kids, and helps them develop a healthy competitive spirit without the physicality of the actual sport. It's also easy to set up and play anywhere you like. If you want your 11-year old to develop wit and strategy at the same time, this product will not disappoint. 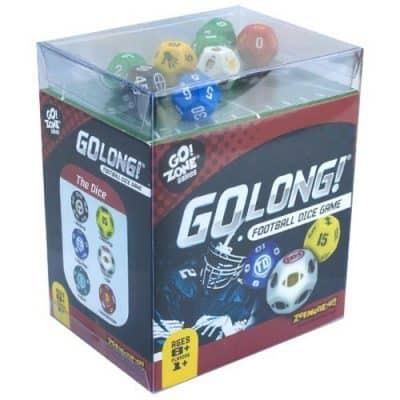 An exciting game of football with a twist, this game uses colorful dice to advance the football in the field, where the goal is the end zone. It comes with eight dice, a dice cup, score card and bag where you can store the whole set. It also includes easy-to-read rules for the game. What's Great About It: It’s a good way to teach kids how to strategize and do math at the same time. Although it’s quite small, it is portable, making the game playable anytime and anywhere. A skateboard is among the popular items on the market for young boys. If your son wants to try it for the first time, then this ramp is a good choice for him. It is only eight inches high; hence, it is safe for 11-year-old boys who are just starting to try out some stunts. 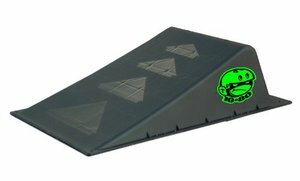 The ramp comes with a slip-resistant finish that provides safety to users without sacrificing the fun of skateboarding. Adding to the safety is the non-slip rubber feet that keep the ramp in place. Take note that the ramp has a weight limit of 125 pounds. What's Great About It: It is functional and safe for kids. It helps beginners learn skateboard stunts without worrying too much about mishaps. Just be sure to take note of the appropriate age and weight for users. This is a good game for all ages, so your son can enjoy it with his friends, cousins and siblings. Being a current craze that is simple and fun to play, it will suit your 11-year-old’s taste. 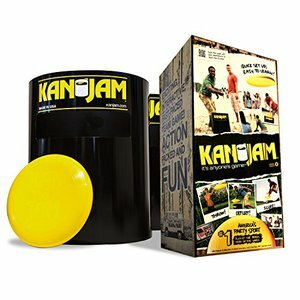 The set comes with portable Kan Jam goals, Kan Jam labels, Kan Jam flying disc, and instructions. It suits backyards, parties, beaches, gym classes, and other outdoor places. What's Great About It: The set is durable and easy to set up. The game itself is beneficial, especially to children who are in the beginning phase of developing their physical skills, accuracy, and coordination. If your son is a fan of Ghostbusters, there is no doubt that this item is one of the best gifts you can give him. 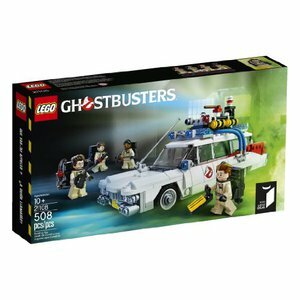 It is a 508-piece building toy that includes four mini-figures: Peter Venkman, Ray Stantz, Egon Spengler, and Winston Zeddemore. It also includes ghost-busting devices and gadgets such as paranormal detection equipment and proton packs. What's Great About It: This set enhances imaginative play and problem-solving skills. It can also strengthen dexterity. Just make sure your child observes care while playing it. This is a building toy; hence there is a chance of them breaking it. With this building toy, your son will be able to enjoy building at least five fully mechanical robots. The set comes with a remote control, three active servo motors, an improved and redesigned color sensor, infrared sensor, redesigned touch sensor, and more than 550 LEGO Technic elements. More than that, the product comes with a gargantuan list of possibilities for creating, designing, and programming a robot. This set will provide hours of building excitement. What's Great About It: Your son can program his robot using a tablet that runs Android or iOS and PC or Mac. Needless to say, it is very beneficial for your son to create something and make it work. Take note that the majority of the building process requires a computer. 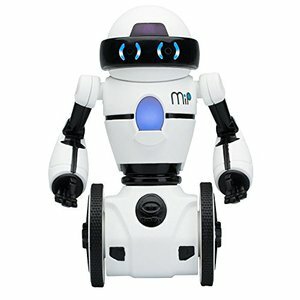 While playing with a robot has always been a favorite for 11-year-old boys, downloading activities and playing in-app games also appeal to them. It is a good thing that this item can provide your child with both in one toy. Your child is at liberty to program his Ozobot Bit to race and dance, among other actions. He can also create his own games, challenges, and activities. More than that, he can opt to build a city of Ozobots. What's Great About It: This kit will stimulate your son's thinking skills and creativity. It also suits both beginners and those with advanced knowledge. It comes with a 90-day warranty, which speaks about its quality. It may be a little advanced for some, but it can definitely benefit your 11-year-old. This Rookie is perfect for those who love puzzles and challenges. You can build this track up to 22 feet long and it breaks down to fit into a seven-inch diameter sphere. It contains 70 challenging barriers that your child will love. To play it, your child needs to flip, twist, and spin the sphere and get the ball to the target. It definitely provides a great challenge to children. What's Great About It: It helps kids develop careful strategies and enhances problem solving skills. 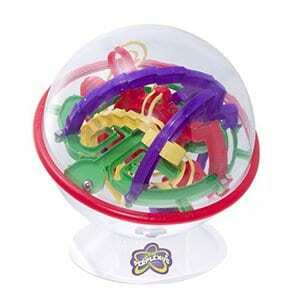 This toy is great for kids of all ages, so the whole family can get involved. It can be difficult to master though, hence the challenge. 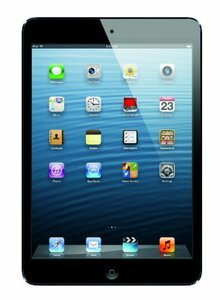 Although smaller than the iPAD, Apple’s iPAD mini brings to the table the features of its bigger brother in a smaller frame. Capable of 1080p HD video recording, this device will capture your 11-year old’s eye for creativity. You can select from 16, 32 or 64 GB variants, as well if it’s Wi-Fi only or Wi-Fi and cellular enabled. What's Great About It: Sleek, user-friendly and feature-packed, you can never go wrong with Apple. Microscopes generally capture the interest of most children. Peeping into it is indeed enticing, especially because you get to see incredible and amazing things through it. It features a six-hole diaphragm and comes with fifty accessories for studying microbiology. It allows users to enjoy up to 400x magnification. 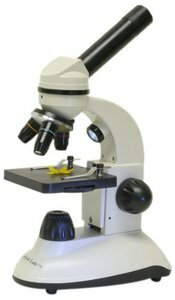 What's Great About It: This is a real microscope, although designed especially for kids. Apart from being fun, it can enhance your child’s interest and fondness for science. It may be challenging to reassemble if your child takes it apart, but you can always ask for professional help. Is your child fond of dancing robots? If so, this item is for him. This robot enables him to not just play with it, but to have one as a sidekick. It can respond to claps, touches, swipes, and other gesture-based interactions. It can roam around the room, and it comes with two wheels that help it in self-balancing. 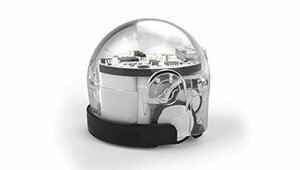 This WowWee robot can also react to various noises in its environment, thanks to the sound detection system that comes with it. What's Great About It: Needless to say, it is fun to have, as it is very responsive. While introducing your child to robotics, it can help him improve his imagination skills. There may be some challenges in operating it, but they’re just like any challenges you may encounter with this type of technology. Do you want your child to increase his physical activities while socializing with other kids? Then this product will be a good option for you. 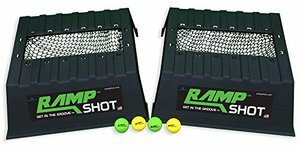 The Ramp Shot Backyard Game is like playing hoops with a twist. It involves four players with two teams. As of writing this, it is the only backyard game allowing players to get points by catching or tossing. The item is portable and light, but very tough. It is weather-resistant as well, making it perfect for outdoor play. What's Great About It: Being a physical game, it improves a child’s reflexes, agility, and motor skills. It can also teach your child how to become a good team player. Of course, it can break due to mishaps outdoors, so it is advisable to observe care when using this product. Beneficial, age appropriate, safe to use, of good quality, and advantageous for children – these are the main things we looked for in each potential item to recommend. We also considered the reputation of the items’ manufacturers. Consumers, especially children, have various needs. For this, we carefully looked into the items that could cater to them. For 11-year-old boys, stimulating their brains, enhancing potential, and improving social skills are very important, leading us to the items on this list. As a buyer, make sure to prioritize the aforementioned facts before choosing a product for your son. Also, it is very important for you to consider his personal preferences. Several things happen in an 11-year-old boy’s mind and body which affect the way he deals with his environment and the people around him. Kids at this stage are experiencing numerous changes and challenges that will need the proper response. Getting near their teenage years, they are in great need of both independence and tender loving care. This is because the brain’s biggest growth spurt happens during adolescence. Numerous things happen in the brain that may become hard to handle. Moreover, an increase in height and weight and transformation in the bones, muscles, and other parts of the body have certain impacts on a kid’s overall development. Hobbies and interests change, and the child has to fully adapt to this transition. While the aforementioned facts are commonly associated with a child's teenage life, know that they can start when a child enters the preteen stage. During this phase, development is very crucial. And with all these things occurring in the child's brain and body, he will need love and support from the people around him. So how do you support your son who is in his preteen stage? There are several ways to do it, and one is to focus on his activities. On this page, we discussed the best toys and other items for an 11-year-old kid. And yes, these things play a significant role in the lives of preteens. The outdoor activity kits mentioned above are of great help in enhancing a kid’s physical development. Throwing, running, and other arm and leg movements can improve his motor skills and increase his agility. You need to encourage your son to continue practicing outdoor sports and introduce new activities at the same time. Without these helpful activities, proper development might not occur. Your son might feel weak and may not be able to adapt to the changes happening to his body. The building toys focusing on electronics and electronic devices play a big role in developing your child’s mind as a whole. The same thing goes for the puzzle and science items. These products enable your child to imagine various things, recall details, and learn some real-life applications. Consequently, this improves his creativity, memory, and problem solving skills. Your son may use these benefits for his future career or in his everyday life. Socialization is very important in a child's life, especially during his developmental years. 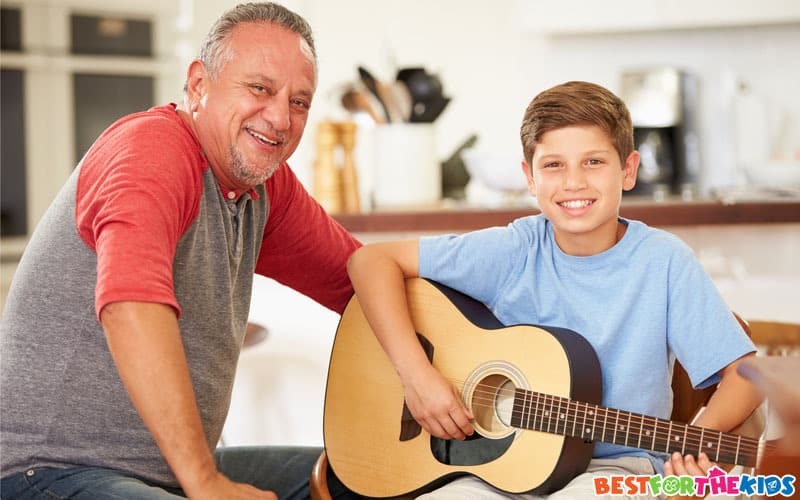 As mentioned earlier, many things change in a preteen’s mind, so your son needs all the support he can get. A good social life plays a big role in making that happen. In the kits mentioned above, those that require playing in teams obviously help improve a child’s socialization skills. Being in a team will enable your son to become more sensitive, responsible, and understanding. Knowing that other people count on him will make him more careful and aware of his actions. Toys and leisure activities are not just about having fun. They are things that your 11-year-old son may rely on during this challenging phase in his life. They could help him properly deal with the changes happening to him and get the crucial support he needs, provided you buy the right products. In this article, we have recommended 20 toys and educational items that are ideal for kids in the pre-puberty stage. Each has its own purpose and can provide your child with what he needs. With your careful consideration of his personal preferences and interests, your child can enjoy the chosen item, and the support it provides.